Make your travel plans here. Cambodia is a study in contrasts. The people of Cambodia survived incomprehensible suffering during the 1970s when an estimated two million people died. This is the same Cambodia that created the magical Angkor Wat. Built between 9th and 14th centuries when the Khmer civilization was at the height of its creativity, it is believed to be the world’s largest religious structure. 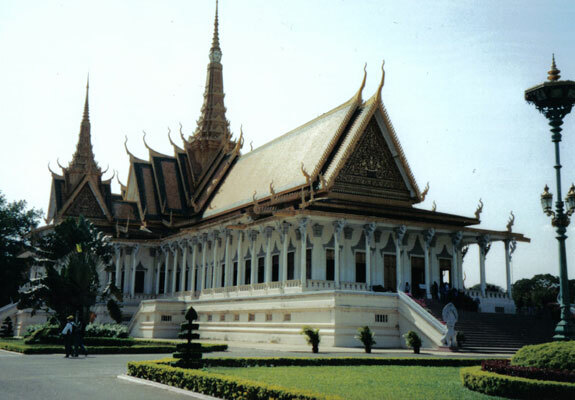 The Royal Palace is a must-see, located on the site of the former citadel, it was built in 1866 by King Norodom. The Royal Palace is now home to His Majesty Preah Bat Samdach Preah Norodom Sihanouk, King of Cambodia, and Her Majesty Preah Reach Akka-Hohesey Norodom Monineath Sihanouk, the Queen. The city is still a combination of old and new. There are more motor bikes than cars on city roads. It is difficult to find a single stop light or other traffic directional signs. But, like all else in Cambodia, it is changing fast with new hotels opening and more tourist facilities available. 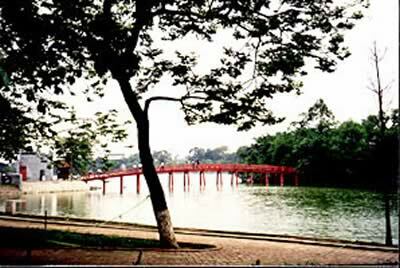 On a picture-perfect day my husband, John and I, bumped along the dusty road from the capital of Phnom Penh to a tranquil place on the riverside that belied the unspeakable horror that took place 25 years ago. 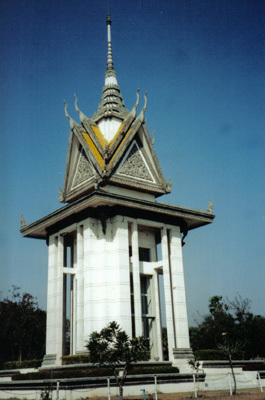 At Choeung Ek, one of the Khmer Rouge’s many killing field, near what was the mass grave for 17,000, more than 8000 skulls, arranged by age and gender, are piled high behind the glass panels of the Memorial Stupa. At the age of seven, when our guide’s family was separated, his father cautioned him, “Never forget your name.” He was forced to spend the next four years in a Khmer Rouge jungle camp. Memories of his earlier life faded but because of his father’s sage advice he was reunited with his family when he returned to Phnom Penh at the age of eleven. Other youngsters were not so lucky. Our choice to travel by boat from Phnom Penh to Siem Reap, the city closest to Angkor was a good one. For six hours we traveled the Tonle Sap River into the lake so large that we could not see the shore. 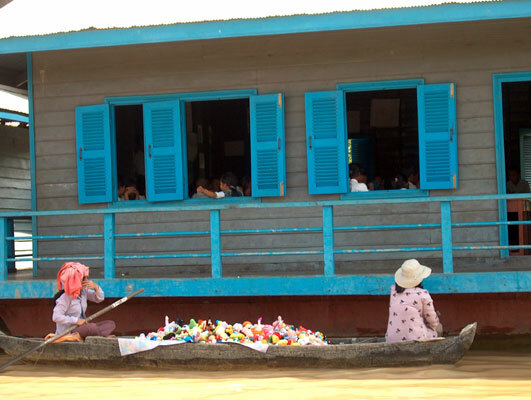 Many people along the waterway still live in rattan mat houses, some on stilts, some on floating platforms. Along the river people fish and farm as they have done for generations. We felt we were seeing the real Cambodia and that the atrocities where a tragic aberration. The last half hour a small boat pulled our 100-passenger boat through the shallow canal of Chong Kneas, a floating fishing village. The children, in uniform, paddle their small wooden boats to the bright blue, floating school, while others fish and go about their daily routine. We developed a respect for the resiliency of the Cambodian people who have survived generations of war with their warm smiles in tact. The glory of Cambodia is found in the huge temple complex of Angkor. It is the heart and soul of Cambodia, a source of great pride and inspiration as they rebuild their lives. Even amid the throng of tourists it is easy to be entranced by the aura of Angkor. Most temples are entered by short jungle walk - disabled veterans play traditional music and monkeys gambol about. Within the temples is the heady smell of incense, saffron-robed monks, fortunetellers, and halls lined with religious bas-reliefs. Angkor Wat, considered the crown jewel, is one of the largest religious monuments ever built. The temple complex covers 81 hectares and is dedicated to the Hindu God Vishnu. The temple is a representation of the Hindu cosmology. The central monument represents the sacred Mount Meru, and the five towers symbolize Mount Meru's five peaks. The temple’s greatest treasures are the bas-reliefs around the walls of the outer gallery and the hundred figures of devatas and apsaras. 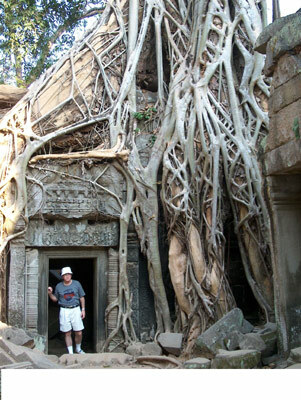 Each temple area has its own special charm from the magnificent carvings at Banteay Srei to the ruins Ta Prohm still locked in the muscular embrace of tree roots. The huge roots have been left and the temple has not been reconstructed giving it a mystical aura. French archeologists wanted to show how nature can destroy man's work. The town of Siem Reap, gateway to Angkor, has attractions all of its own including the country’s best hotels and restaurants. It is growing by leaps and bounds. The new Cambodian Village gives visitors a taste of traditional Cambodian life with recreated buildings and folkloric shows. Change is coming fast, especially in Siem Reap. In 10 years the old Cambodia will be hard to find. For more information check www.mot.gov.kh!! !